This class is the required prerequisite for the CST for Infants – Advanced Clinical Skills class. It is also the recommended prerequisite for the CST for Toddlers class taught by Teresa Robertson. The work I do with infants is efficient, powerful and lasting. I have seen amazing results. There are so many infants who would benefit from this therapy and so few people to treat them. I believe that if infants get early treatment they are more likely to realize their life’s potential and less likely to need ongoing care. Only a few craniosacral therapy training programs offer any infant treatment instruction. They all require students to complete many levels of expensive training before they can learn to treat infants. The training, sadly, tends to be fear-based and pathology-focused. 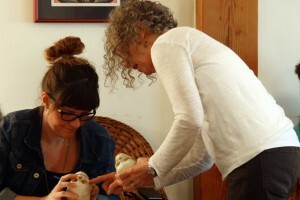 I teach from the midwifery model of care perspective and from the baby’s point of view. I am passionate about getting these vital skills into the hands of people who can help mothers and babies. I believe that the beginning of life is where the work should begin. It is easier to learn how to treat babies first and then transfer those skills to treating older children and adults. Learning to treat adults first and then transferring those skills to treating babies is actually much harder. Subtle Hands-On Skills is the required prerequisite for this class. I will waive this requirement if you have already studied CST with me. I will not waive this requirement if you have only studied CST elsewhere. While not required, students are encouraged to receive at least one craniosacral therapy treatment prior to taking this class. This five-day class includes an infant anatomy review plus lectures, demonstrations and lots of supervised hands-on practice with pre-crawling babies. Each student treats four babies during the class and all student treatments are case reviewed by the group. In order to maximize learning success class enrollment is limited to eight students. Graduates of this class are eligible to participate in monthly free infant CST clinics in Portland.